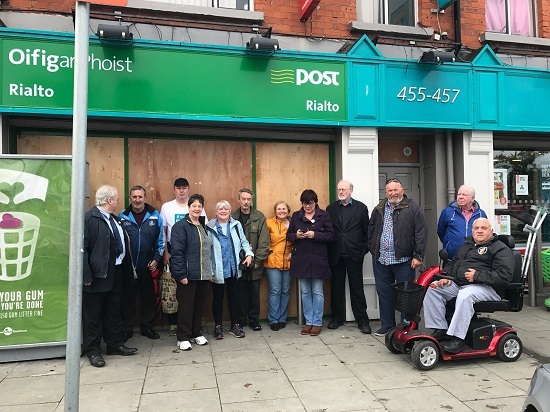 On 24 November 2016 there was a large queue of people chatting outside the post office in Rialto where people went to collect pensions, disability and other social welfare payments, pay bills and carry out banking. A note on the door said that the post office was closed for business and offered Dolphin’s Barn as an alternative. Rialto has a large number of older people and others who depend on the post office. Many with mobility issues use rollators and Zimmer frames. Accessing Dolphin’s Barn was very difficult. They were using taxis they couldn’t afford to get their pension. One older resident told me she, “wouldn’t be able to pay towards her heating this week as it went on the taxi”. The closure was done without notice or any form of consultation, just a note stuck on the door. Another issue was the detrimental effect the removal of the post office would have on the local businesses which always benefitted from its proximity. If this sudden move from Rialto to Dolphin’s Barn became permanent it would lead to loss of community spirit and dereliction of the local area. For many people the post office was the only place they might talk to someone all week. A small group of local residents, myself included, gathered in our local community centre to form a campaign and we wrote to An Post to seek a meeting. That Saturday we started collecting signatures on a petition to reopen Rialto Post Office and we did so every Saturday at the Rialto shops throughout Christmas. Though we never met with An Post they were very aware of our campaign as it gathered momentum. We produced banners and fliers with the help of local businesses. I would also like to thank our local elected representatives – from all parties – who were very supportive of the campaign and contacted An Post directly. In late January 2017 we learned that it was not An Post’s intention to terminate the post office service in Rialto but they needed a new location. This was good news and very hopeful but we needed to be vigilant to be sure we did get our post office back. We kept in contact with suitable businesses in the area and we continued our campaigning. In early April we learned that Rialto Centra had been successful with the tender and it reopened on 12 June. We continued the campaign for a few weeks urging people to now use the service and return to Rialto Post Office. Our very strong campaign lasted seven months with great local support and we were thanked even by the few who said during our petitioning "sure you’re wasting your time, it’ll never happen, it’s gone”. I wanted to tell you the story of our campaign as a way of acknowledging all of the local people and representatives who supported us. For more than seven months, right through winter and spring, we collected signatures, ran stalls and organised meetings. Many told us we were wasting our time and that the post office would never come back. While I am proud our campaign succeeded, I know similar campaigns in other places have not, and I believe communities should not have to fight so hard to protect our essential services. Since the Sandymount PO closed some pensioners have to go to Ballsbridge n a taxi to colect their pensions.